Jim Rogers is the best-selling author of several books, including Investment Biker: On the Road with Jim Rogers, Adventure Capitalist: The Ultimate Road Trip, Hot Commodities: How Anyone Can Invest Profitably in the World's Best Market, A Bull in China: Investing Profitably in the World's Greatest Marketand his latest, Street Smarts: Adventures on the Road and in the Markets. He is an investor who has been chronicled in Jon Train's Money Masters of Our Time, Jack Schwager's Market Wizards, and other books. After apprenticing with Arnhold and S. Bleichroeder in the early 1970s, Mr. Rogers co-founded the Quantum Fund, a global-investment partnership. During the next ten years, the portfolio gained more than 4,000%, while the S&P rose less than 50%. 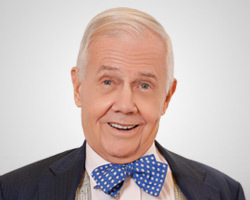 He retired at 37 and has since then continued to manage his own portfolio, served as professor of finance at the Columbia University Graduate School of Business, and appeared as a regular commentator and columnist in various media. Mr. Rogers has been frequently featured in Time, the Washington Post, the New York Times, Barron's, Forbes, Fortune, the Wall Street Journal, the Financial Times, and most publications dealing with the economy or finance.